States Should Get Into The Sports Gambling Game Commentator Frank Deford takes a close look at fantasy sports and concludes the profits to be made there are very real. 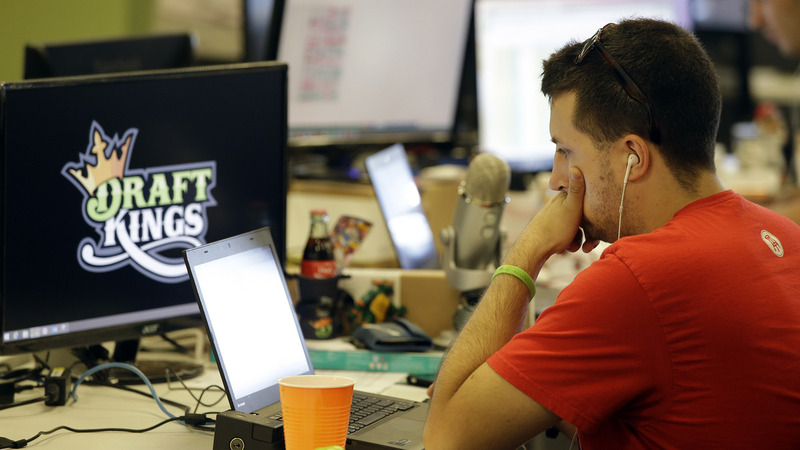 Devlin D'Zmura, a news manager at daily fantasy sports company DraftKings on Sept. 9. Customers of the two biggest daily fantasy sports websites — DraftKings and FanDuel — filed at least four lawsuits against the sites in October 2015. The customers accused the sites of cheating, and argued they wouldn't have played had they known employees with insider knowledge were playing on rival sites. I have an idea to help the Republicans solve their presidential nominating dilemma: Let's have a fantasy primary campaign. The Fox network can run it, and the voters will choose which candidates they think will win the various primaries. After all, fantasy is in, fantasy is fantastic. In sports, fantasy is giving reality a run for its money. Why should sports have all the fun? Now, the general idea goes back at least to 1949 when Germaine G. Glidden, a distinguished portrait painter and former squash champion, who liked to go by the romantic, spy-like moniker of G-3, proposed to his brother that he could pick 10 baseball batters who could hit for a higher average than any 10 his brother could choose. This quickly evolved into what was called The Three Hundred Club, with a substantial membership. And, then, so far as we know, the first sophisticated football fantasy version was dreamed up by a businessman named Bill "The Gill" Winkerbach in 1963. Click the audio to hear more about Frank Deford's fantastical idea.